James Bond 007 Collection - Tenor Saxophone (Book/CD) (Tenor Sax). For tenor saxophone solo. Instrumental Series. Movies and Play Along. Difficulty: medium. Tenor saxophone solo book and accompaniment CD. Standard notation. 30 pages. Published by Alfred Music (AP.IFM0035CD).ISBN 0769299164. With standard notation. Movies and Play Along. 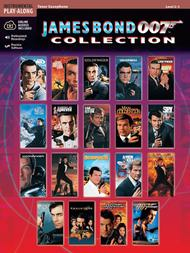 9x12 inches.A complete collection of all the major themes from 19 James Bond movies. This instrumental collection offers compatible arrangements specifically created for the level 3 player along with fully orchestrated accompaniment tracks. Titles include The James Bond Theme, Live and Let Die, Tomorrow Never Dies and many more.